Amazing Healing Powers of QiGong and Tai Chi Kung. If you want to see inexpensive & beneficial health care look no further than China that has been using the healing arts of Qi Gong (pronounced Chee GONG) practiced there for over 5000 years and is much older and much simpler to do than Tai Chi. Last year I witnessed the power of this ancient art when I met a man named Joe Pinella that has been practicing QiGong for over 40 years and teaches it here in Tucson. He will be working with Healing Arizona Veterans as part of our comprehensive healing program. When you read his story you will be convinced that this healing exercise can literally change lives and give hope to our veterans that perhaps had given up any hope for recovery. After a catastrophic car accident, Joe Pinella was diagnosed quadriplegic and told by doctors that he would never walk again. But, against all odds, Joe Pinella used the ancient Chinese healing techniques of Qi Gong and Tai Chi Kung to relieve his pain, regain his strength… and train his body to walk again! Joe Pinella knows firsthand what it is to recover from severe injuries that medical doctors and physical therapists said would leave him permanently disabled. Joe broke his neck and back in a catastrophic car accident. The doctors who treated him in the emergency room were amazed that he survived. They removed two vertebrae and four discs from his neck. They told him he would be a quadriplegic. When Joe proved them wrong, they told him he would be severely disabled for life. He could not feed himself, wash, shave or dress himself. Joe did not accept this verdict and turned to his background in the Chinese healing arts. As a young man, Joe had studied the ancient Chinese healing arts of Qigong and Tai Chi Kung… and he was certain that these healing movements would offer him a way to recovery. He knew things were possible that Western medicine did not accept. And he was right. As he turned to this ancient form of self–healing, Joe fully recovered his ability to walk, take care of himself and relieve the unremitting pain by using Qi Gong and Tai Chi Kung. Tai Chi Kung is based on very specific slow movements that help strengthen the body’s muscles and connective tissues. It is the same ancient Chinese healing art that Joe Pinella used to retrain his body to walk again. For centuries Tai Chi Kung was a secret art, known only to a select few in the monasteries and royal households of China. In the early 20th Century, the practice made its way to North America and has gained a great deal of attention in recent years as more and more people discover the amazing healing benefits from this type of very specific, slow and low impact exercise. 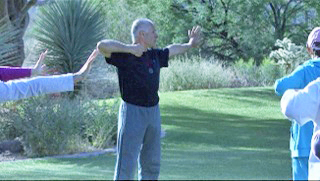 Medical studies now validate that the slow, repetitive movements of Tai Chi Kung measurably increases internal circulation, improves balance, relieves stress, improves cardiovascular fitness, helps regulate blood pressure and can have a positive impact on Arthritis, Diabetes, Chronic Obstructive Pulmonary Disease, Multiple Sclerosis, Fibromyalgia and Parkinson’s. Joe PInella teaching a class his healing movements program. Years later, after having helped himself recover from pain and regain full motion, Joe set out to help others by creating his Healing Movements System. What Joe found in his own recovery process – and what he found in teaching hundreds of people – is that some Tai Chi and yoga can be just too difficult to do for people in pain. Tai Chi is most often taught as a “Form.” A “Form” is a sequence of individual moves. A form may consist of hundreds of moves in a specific sequence much like a choreographed dance. This kind of Tai Chi is wonderful, but can be very daunting to someone just starting out, or to someone who has a specific complaint, like severe arthritis of the knees or a tennis injury they would like to address. Likewise, some aspects of yoga are very helpful and other aspects can be harmful if attempted too soon or not performed accurately. In developing his Healing Movements System, Joe went back to the fundamental principles of these ancient techniques. He took the best elements of each… and then put them into a format that is easy to follow and easy-to-do by people of any age and any skill level. This system consists of breathing exercises, slow gentle movements coordinated with breath and visualization. These healing exercises are similar to the individual movements used in Chinese physical therapy… and have been proven over the years to help loosen stiff joints and relieve pain. Many people who have tried Tai Chi and found it too difficult to learn all the steps have done Joe’s program easily. Joe’s program is Chinese physical therapy. Joe Pinella teaching a class demonstrating his proven methods. By rotating all the major joints of the body, you expand and contract most of your muscles, thus increasing circulation and range of movement. You stimulate the production of synovial fluid, which bathes and lubricates all your joints. Breathing exercises open your lungs allowing you to take in more oxygen and expel toxins. Healing Movement builds muscle strength, which is critical to catching yourself from falling. It improves the health of your entire circulatory system as well as gently working the heart. Its slow, calming motions coordinate your nervous system and your muscular system. Healing Movement exercises also enhance the performance of specific functional movements so that the activities of your daily life are easier to perform. In Healing Movement, you work on training entire movement sequences rather than just building the individual muscles involved in the movement, like you do in conventional strength training. Your brain controls the movement of your muscles, and it thinks in terms of whole movement sequences, not just individual muscles. These gentle movements, based on Qi Gong have helped thousands of people with Arthritis, Parkinson’s, diabetes, heart disease, and cancer lessen their pain, regain more movement, increase their energy, and live a better quality of life. Here are some brief testimonials on how the exercises changed lives of some local residents he has taught. An 88 year-old woman who wears her long gray hair in a bun on top of her head. She did the program for six weeks in a wheelchair. One evening after class she pulled Joe close for a kiss on the cheek. She told him that for several years she had been unable to put her own hair up; her grown daughter did her hair every morning and she did not like the way her daughter did her hair! That morning was the first time in three years that her arms were flexible enough to reach up and do her own hair. Elizabeth. A sixty six year old woman who always had to unbuckle her seatbelt to back out of her driveway. Her neck and shoulders were too stiff to look behind her while backing up. After doing Healing Movements System for eight weeks, she is now able to keep her seatbelt on! Kathy. A reflexologist who had to stop working because of the pain in her hands. She is back to work now. Tai Chi Kung has been very beneficial to me. I have severe osteoarthritis in my neck, knees, shoulders and wrist. Since I started practicing Tai Chi Kung I feel a lot looser, have more flexibility and less pain overall. I like this form of exercise because it is low impact, easy to learn and I can practice it at home on my own. Anybody can do it. You don’t have to be in great shape to do it or be very flexible as for instance Pilates or Yoga. Also you don’t need any special equipment. I have improved my lung capacity and stamina. I can now go for walks for an hour or longer and not get winded at all. This is a great way to get in shape specially for older people who may have physical problems and can’t do some of the more strenuous exercises. I have arthritis and tendonitis in my right wrist. The doctor, recommended physical therapy sessions twice a week which included ultrasound, hot and cold pads and various exercises. I was still in treatment when I went to your class and had not been able to play golf for three months. I was not making any progress fast and was quite discouraged. I was in too much pain to even pick up a golf club, let alone try to swing it. I started going to your classes twice a week and also practiced the Tai Chi Kung exercises at home. A week later I started playing golf again and did not have too much pain. I have stopped all the other treatments but continue to practice Tai Chi Kung and attend your sessions. I am very pleased with the results. I feel a lot better and have more energy. My wrists are getting stronger and my golf handicap is going down. I have a really bad back, with severe scoliosis and degenerative disc disease. I’ve been going to a very good physical therapist for five years who has me do “corrections” several times a day to help balance my pelvis, which often gets out of alignment, causing hip pain and sciatica. Once a month or so he does deep tissue work on my back and also balances my pelvis. I’ve been doing Joe’s Chi Gong exercises for six weeks now. This past week I went to my physical therapist for a regular treatment, and FOR THE FIRST TIME SINCE I’VE BEEN SEEING HIM he didn’t have to balance my pelvis. He still did the deep tissue work, but said my back felt much less tight than usual and that my legs were not different lengths, as they usually are. Since nothing else has changed, I have to credit Chi Gong for this positive result. These are just a few of the testimonials I have read and I use them to show you additional convincing proof that Qi Gong and Tai Chi Kung can help many to heal and have a more hopeful future than they imagined possible. Here is a video explaining the difference between Qi Gong and Tai Chi Kung. He has a DVD for sale of The Healing Movements System and it is available at http://www.joepinella.com.